One of my favorite concepts from my former life as a project manager is called the “Triple Constraint”. The Triple Constraint consists of three sides of a triangle. On one side we have Time, on the second, Scope, and on the third, Resources. 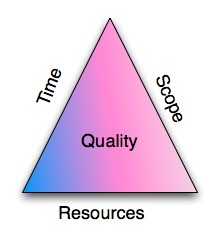 At the center of the triangle is Quality. 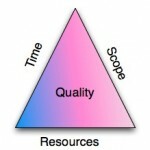 The theory behind the Triple Constraint is that a project has three primary elements that determine its quality or success – the amount of time it will take to complete the project, what you are trying to accomplish with the project, and the amount of resources (people, money, equipment, materials) available to reach your goals. The key is that you cannot change one side of the triangle without affecting the others. For example, if you are rolling out a new email system to your entire company, the project scope and the available resources will determine how long the project will take to complete. If Mr. Bottomline Manager says that you need to roll out the new system sooner than your projected launch date, you will either need more resources or will need to reduce the scope of the project to hit your new timeline. There can come a point, however, where scrambling to throw more resources at a project or reducing the scope too dramatically can alter the quality of the project or even make the timeline impossible. For example, reducing the scope of rolling out a new email system may be completely implausible since it’s core to the business. Finding resources to help roll it out may be too difficult since it requires very specialized and rare expertise. This also applies when doing something as simple as cleaning your home for expected houseguests. If you suddenly learn your guests are showing up in 10 minutes, then no matter how many people or how much money you throw at the problem, there’s not much you can accomplish. So you reduce your scope, throwing everything in a closet. It’s a relatively simple, yet powerful business concept that translates well to all the projects in your life and even Project Life itself. We have dreams and ambitions that we are trying to realize within the time span of our life with an ever-changing array of resources at our disposal. Be it for our daily to-do list, a house project we’ve been dying to get to, or one of our most precious dreams, the Triple Constraint is a handy reminder of all the intersecting pieces of what is required to realize a quality life. With the right timeline, the right resources, and your goals in hand there is exactly enough of everything necessary to accomplish what is most important to you. And if, from where you’re standing, you can’t see how you can actualize your deepest dreams because George Clooney isn’t the marrying kind or the U.S. is no longer sending manned trips to the moon, just give it some time and possibly a pinch a magic because anything is possible.